Telling about the boots and the climbing shoes to talk about mountaineering. When you listen to certain people talking, it is a bit like finding yourself in areas which are so beautiful that they happen only every so often, and it makes you want to take a photo. Everything surrounding you seems lit up by a special light which up to a moment before you hadn’t noticed and everything, the landscape and the people next to you, things, suddenly seem to have taken on a perspective and a meaning which they never had before. I had never noticed this order and logic of things before, I had never noticed those symmetries. Pulling out your smartphone from your pocket aiming the lens towards the horizon, you try and get an image right and while you look for it, while you stare at the screen which you hold it in front rotating on itself you realise that there is nothing you can take a picture of. Inside the smart phone’s screen, there is nothing. Nothing that you can take away with you separating it from the rest. You take the photo regardless but when you look at it, and then you look at reality, you understand that the only way of enjoying everything surrounding you is to comprehend it as a whole. Listening to Reinhold Messner talking about alpinism and the history of alpinism more or less has that effect. He came to La Sportiva at Ziano di Fiemme for the interview and after exchanging some small talk, we started recording. The first questions for the interviewers didn’t really flow that easily. I mean, talking to the most famous alpinist in the world, the first man to have climbed all fourteen 8.000 metre peaks of the planet and a lot more (Messner explains that he is living his seventh life) is a bit intimidating. Gradually though the right atmosphere is created, the right feeling. Messner started talking freely and from one point onwards no longer with answers. His was a conversation, in which everything seems perfectly logical and comprehensible and it was nice to listen to that flow of thoughts and ideas in silence. Each concept appeared linear and easily accessible, clear. It was difficult to establish where the beginning and end of the answers to the questions lay. Messner is a visionary, irrepressible. It is difficult to separate each topic, one from the other, because his knowledge on the mountains and alpinism, probably more in general of man and his efforts to live, is so stratified and detailed with time that it is astonishing to grab the meaning and the suggestions he offers. The interview’s theme was the future and Messner talking about the future spoke above all about vision. «It is vision that drives progress, in any field». After a while he probably started to feel more at ease and he went straight to the heart of the interview focussing on three main topics, of which he spoke with ardour. Before starting off he settled himself more comfortably leaning on the armrests and looked around the room where we were recording, he must have felt the need for a preface to what he was about to say: «The success of La Sportiva, is the following: it is the achievement. Starting off from ideas, projects, work, all these things were born. It is the creation, the success of man: to imagine and to then achieve». 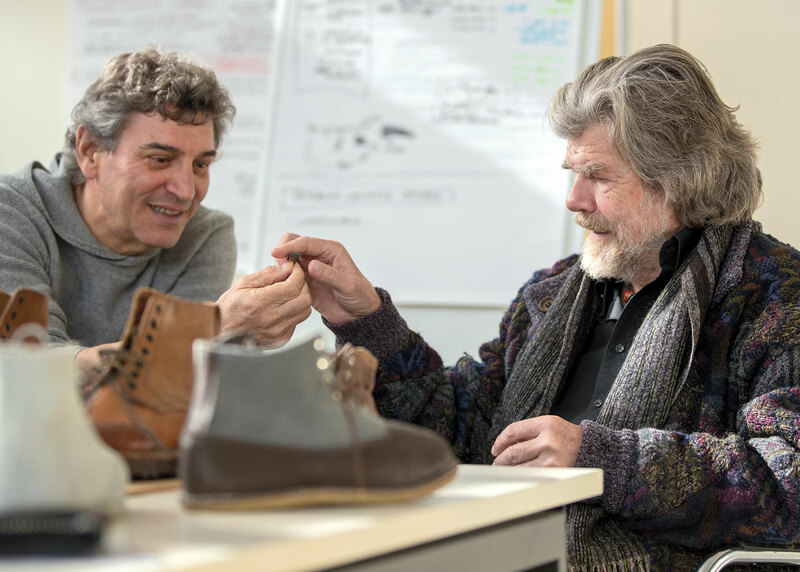 At the end of Reinhold Messner’s interview it was as if he still wanted to talk. We asked him to explain in detail about his project with La Sportiva and his film, his eyes lit up with enthusiasm. «To fully understand the story of alpinism, we need to take a look at shoes. The type of shoes that alpinists use tell us if they will be able to overcome a certain difficulty, or not. Here - he holds a boot which La Sportiva made reproducing the boots used at the end of the 30s which will be used during the making of his next film - here we have a boot manufactured as it was made 90 years ago. Boots like these were used to approach the mountain, to climb up screes to the base of the rock face, to climb up to a certain difficulty on rock and then to walk on hard snow or on ice. Then, from a certain difficulty onwards, from a certain era onwards boots will start to be coupled with crampons. In 1937 at Nanga Parbat boots like this pair were used, they were also used in the Alps but with an inner boot to fight the cold». Messner continues to talk enthusiastically, there is no longer a need to ask questions. «It is very interesting to compare yesterday’s boots with today’s to understand the development and the history of alpinism. Today’s shoe weighs half the weight of yesterday’s and it is possible to resist at 8000 metres - at 40°C and survive without frost bite. The boots we use today are a result of 90 years of artisan history, of technology and of experience gained by alpinists. The ‘state of the art’ of alpinism of each era is narrated by the type of shoes being used. That’s why I want to make a film about this». Messner tells us about the project he is working on: «This summer I am making a film on Grohman and on the Cima Grande di Lavaredo which was climbed for the first time in 1869. Grohman climbed up the south face of this mountain approaching the mountain with a pair of sturdy boots and then using lighter shoes to climb up the route, they were called cat feet. The Guides climbed using woollen socks. The mountaineering history of Cima Grande di Lavaredo gives us the opportunity to narrate and understand the various phases of the history of alpinism. To imagine the future you need to know the history and understand the past».